I wasn't feeling myself lately. I wasn't inspired at all. In fact I was too lazy to put tohether a proper post. * Spread the love to 15 other bloggers. 1. I love love love my little Rozi (my dog Chihuahua). She is the best dog, she always makes me so happy. 2. I can't live without tea. 3. I'm afraid of spiders! 4. I study Graphics and Interactive Communications. 5. My favorite food is pasta. 6. I love meeting new and interesting people. 7. I love learing new things. I want to pass this award to some new and old bloggers that deserve to pay a visit. thank you for the lovely award!!!! i'm always happy to read and know more facts about you! we are very similar on number 3,5,6,7 - however on the others, i study maltese, i love coffee instead of tea, and i love my cat instead of a dog haha! yea! 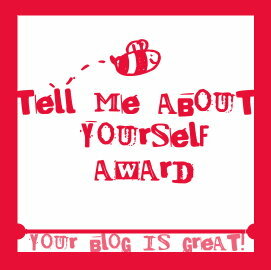 thanks for the award and happy birthday to your blog! I think we started almost together, I too started almost a year ago to post regularly! Outfit "So Simple with Glitter"